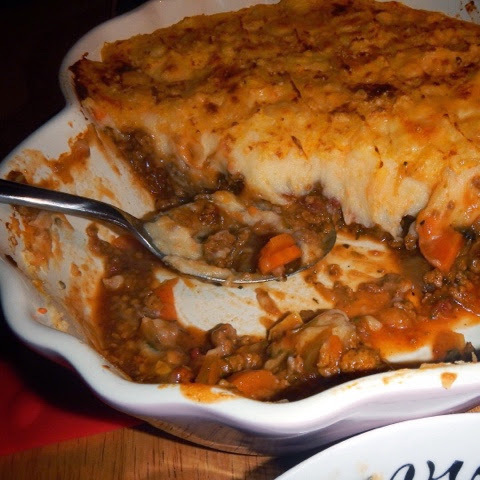 I am currently in a food coma after scoffing down half of an enormous cottage pie; I would have tried to squeeze in the rest (it was so good) - but my husband took care of that, thankfully! I love finding vegetarian versions of old classics, especially when it is a dish that I never really enjoyed because of the taste/texture of the meat used. It's quick and easy, especially if you cheat with the mash topping; I use ready-made, just to speed up the process. 2. Heat the oil in a large pan and fry the onion, garlic and carrots for a few minutes, until softened. Stir the curry powder through, then add the vegetarian mince, tinned tomatoes, stock pots/cubes, water, mushrooms and grated courgette. Bring the mixture to the boil, then lower the heat and simmer for 20 minutes. Taste and season to your liking with salt & pepper. 3. Warm a large baking dish underneath the grill whilst mashing the carrots, swede and potatoes. 4. Blend the cornflour with 1 tbsp cold water and use it to thicken the filling. Pour the mixture into the baking dish and spoon the vegetable mash on top. Sprinkle with a bit of cheddar and grill for about 8-10 minutes. Now stuff your face, trying to stop before you explode!